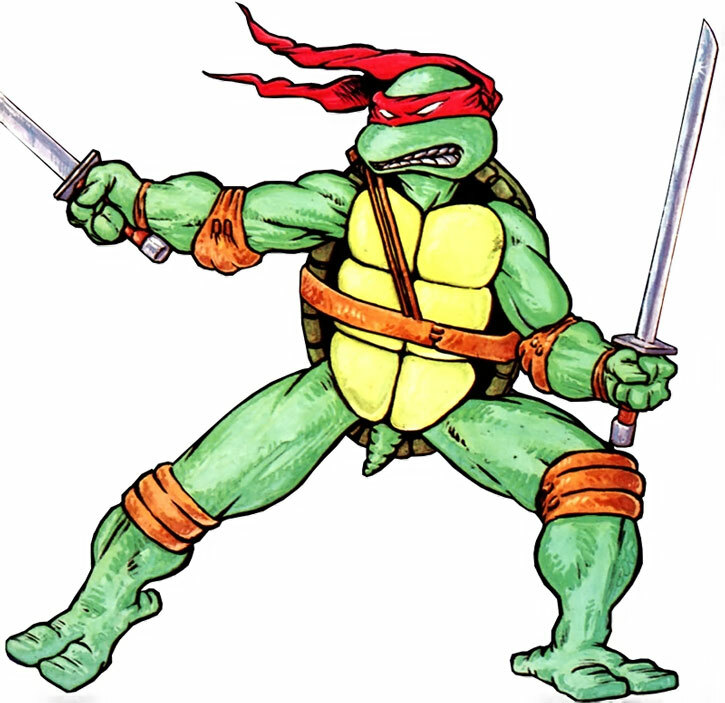 Known Relatives: Raphael (Brother), Donatello (Brother), Michelangelo (Brother), Splinter (“Father”). Height: 4’9” Weight: 150 lbs. Leonardo has no true superhuman powers. However, his mutation into a bipedal form did not remove any of the species wide adaptations that one would find in reptiles classified as turtles (chelonians). Though it has yet to be confirmed, Leonardo’s mutation has most likely converted him into a warm-blooded organism (unlike normal turtles). 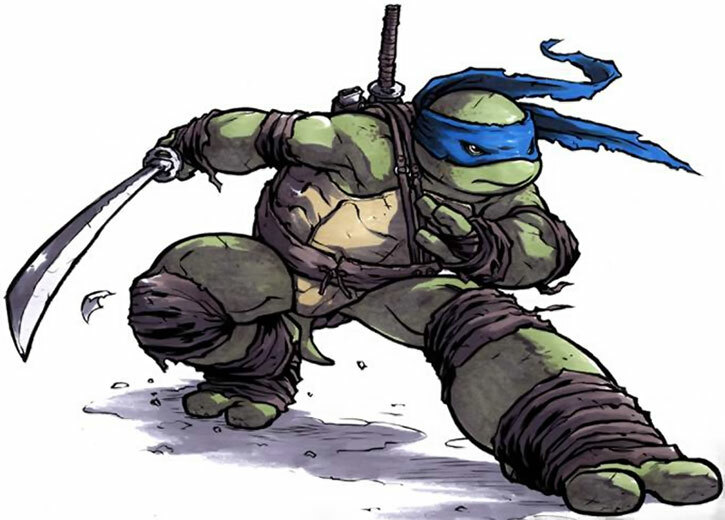 Through intensive life long training, Leonardo has become a formidable hand to hand combatant. He is a master of both the iaido and kenjutsu martial arts styles and has displayed a level of skill in both that one can only find in cinematic martial artists. Finally, Leonardo has mastered the art of ninjutsu. His skills of stealth and deception are so polished that he can virtually hide in plain sight. 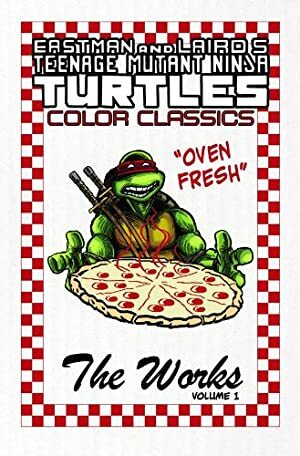 Of the four turtle brothers, Leonardo is not the strongest (Raphael is), the smartest (this goes to Donatello) or the best athlete (this falls to Michelangelo). But overall, he is the “best” of the brothers. 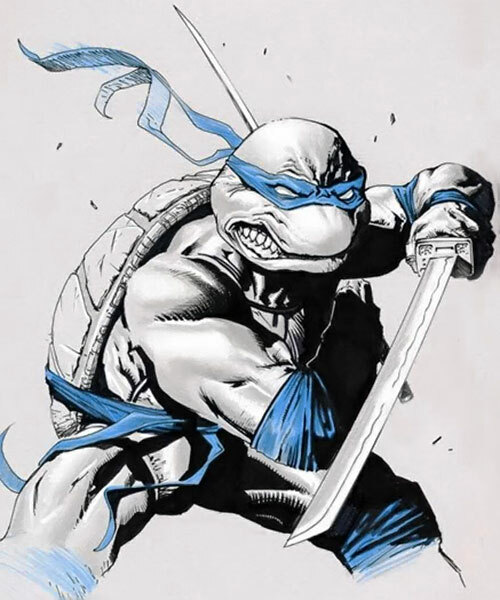 Due to his intense focus and constant training, Leonardo has grown to possess the highest level of skill as a warrior. His every movement in combat is measured, precise and ultimately deadly. 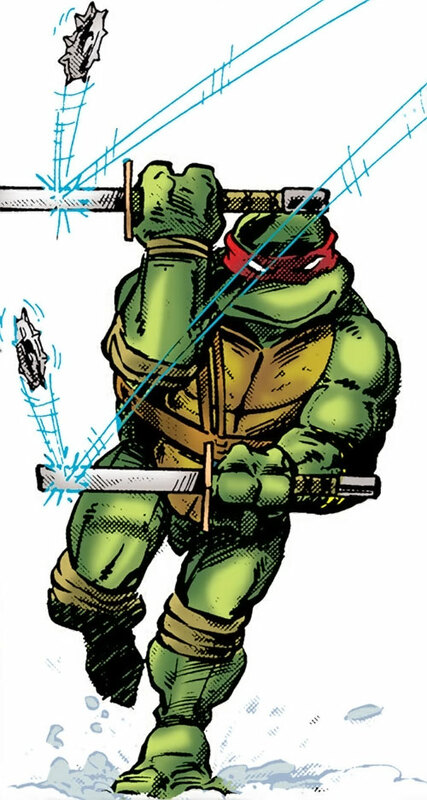 He currently is capable of fighting and defeating the Shredder single-handedly whereas it took all 4 turtles accomplish this feat during their initial encounter with the villain. 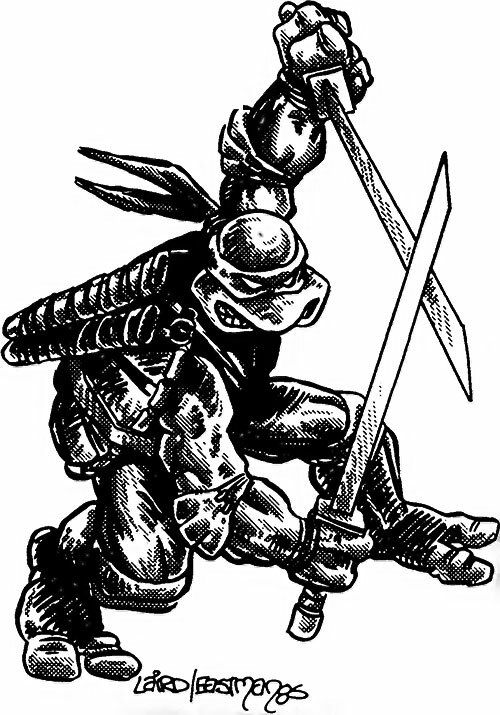 Leonardo wields a pair of katana in battle. He also keeps a reserve of shuriken on his person at all times. Like all of his brothers, Leonardo appears to be a large bipedal turtle. His body is hairless and his skin is deep green colour. Both his hands and feet are three fingered/toed, and his eyes are jet black. Unlike a regular turtle, his eyes point directly forward and are distinctly human in appearance (if not unusually large). In comparison to his brothers, Leonardo is in the middle range for size and height. Leonardo has a large and pronounced shell situated in the centre of his back. It is clearly a part of his body, and extends across the entirety of his torso. The portion of the shell that covers his chest, stomach and crotch area is a light brown in colour. 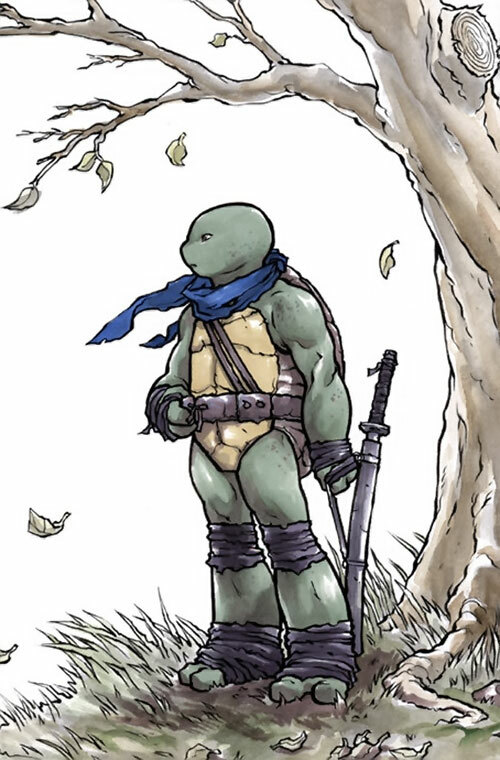 With his shell protecting his modesty as well as his vitals, Leonardo doesn’t normally wear cloths unless he is attempting to hide his mutated features from humans. The only clothing that he wears is a battered leathern belt that he utilizes as a harness/holster for his weapons, dark black strips of cloths around his joints (wrists, elbows, knees, and ankles) and a red strip of cloth that he wears around his eyes when expecting combat. The cloth resembles a domino mask while on, but in truth does little to protect his identity. Presumably, he wears the cloth for symbolic effect. 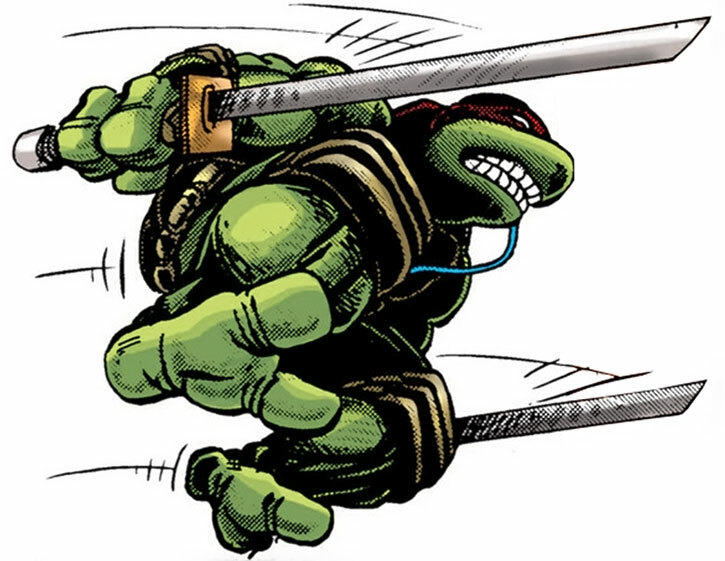 Though it has never been explicitly stated, Leonardo follows the tenets of bushido . He closely values the concepts of righteousness, courage, honour and loyalty. He is honest to a fault and possesses the strongest personal work ethic of all of his brothers. He is a classic over-achiever and true believer. He is focused and goal oriented, and obsessed with achieving perfection in all that he does. This obsession drives him to train relentlessly and to punish himself for minor failures that others would simply gloss over. Leonardo is the de-facto leader of the 4 brothers and naturally takes charge of situations in the absence of their father. He has a sharp tactical mind and can create cunning plans on the spot. Leonardo has a complex relationship with his siblings. His highly spiritual and “old-fashioned” views often conflicts with Donatello’s modern/scientific mind. And his quiet and composed nature is in direct opposition to Raphael’s explosive personality. However, when the chips are down, the brothers will fight to the death to protect one another. As complex as his relationship is with his brothers, Leonardo’s relationship with Splinter is a simple one. It is one of complete and utter loyalty. Leonardo defers to Splinter in the same manner that a Samurai would defer to their Lord. He sees Splinter as a source of wisdom, comfort and strength. Familiarity (Japanese History, Ninja Lore), Iron Nerves, Leadership, Schtick (Paired Weapons (Katanas)), Sharp Eye. 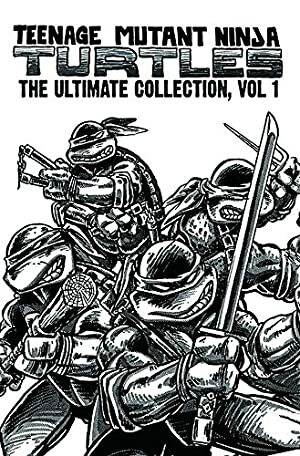 Raphael (High), Michelangelo (High), Donatello (High), Splinter (High), April O’Neil (High), Casey Jones (High). Katana (x2) [BODY 04, EV 04 (05 w/STR, 08 w/Martial artist)].